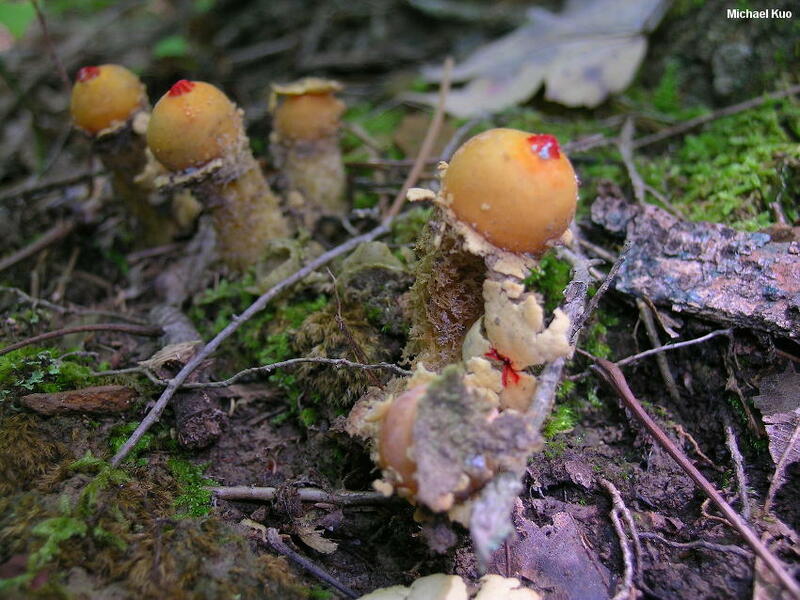 This distinctive, funky fungus is fairly common in the southern Appalachians, but has been reported from Arkansas to Massachusetts. It looks like a little yellow globe with puckered red lips, sporting a tattered collar, held aloft by an odd pedestal of half-digested pasta. 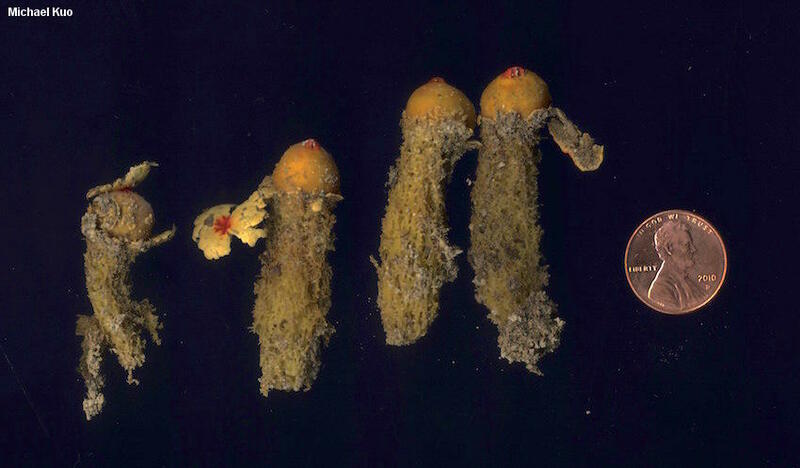 It's hard to imagine mistaking Calostoma lutescens for anything else, but Calostoma cinnabarinum is somewhat similar (differing in its red spore case and gelatinous sheath) and Calostoma ravenelii is very similar to the naked eye (differing in its lack of a collar and its ellipsoid, rather than round, spores). Thanks to Felicity Lien for documenting, collecting, and preserving some of the illustrated mushrooms; her collection is deposited in The Herbarium of Michael Kuo. 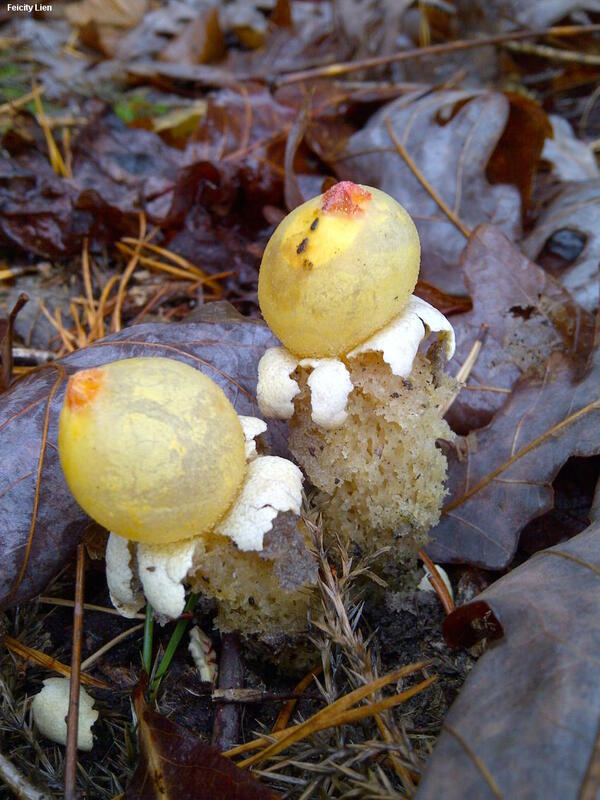 Ecology: Mycorrhizal with oaks; growing alone or gregariously; fall, or over winter in warm climates; apparently distributed from Arkansas to Massachusetts, but most common in the southern Appalachians. The illustrated and described collections are from Kentucky and Virginia. 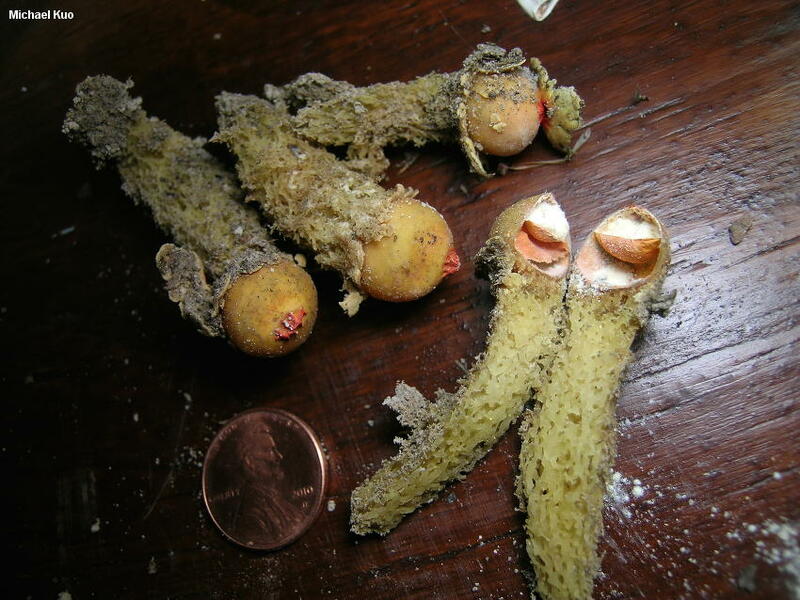 Fruiting Body: Spore case round or nearly so, 10-15 mm across, orangish yellow, bald, with a lined, crimson, beak-like opening; outer skin initially covering spore case but soon breaking apart to leave collar-like fragments at the base of the spore case, pale yellow, felt-like; interior powdery at maturity, ivory colored; stem 4-5 cm long, 1 cm thick, composed of longitudinal, interwoven yellowish strands; odorless. 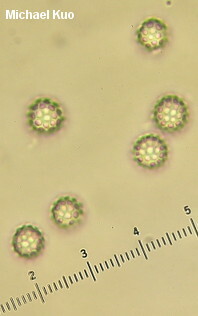 Microscopic Features: Spores 5-8 µ; globose; regularly and deeply pitted (reminiscent of a golf ball); walls grayish in KOH. REFERENCES: (Schweinitz, 1822) Burnap, 1897. (Saccardo, 1888; Coker & Couch, 1928; Smith, Smith & Weber, 1981; Bessette, Miller, Bessette & Miller, 1995; Hughey et al., 2000.) Herb. Kuo 09241110, 01271501.